The last week of December 2011 has seen a report that a diet rich in omega 3 fatty acids (fish) together with high levels of vitamins reduces the likelihood of Alzheimer's disease. Be it the process of living, recovering or improvement, diet and nutrition and we mean what you actually eat not what you withhold is fundamental. Recent figures show that more than 60% of the adult population of the United Kingdom are significantly overweight to what is currently defined as obese. Being overweight doesn’t just mean you are more likely to have various illnesses; it just gives you less energy and reduces stamina. Imaging carrying an extra one or two suitcases as happens when we go on holiday. That is in effect what many of us are doing by being overweight. Many of us rush so much that we miss breakfast, grab a sandwich at lunch and do not drink enough water. We then wonder why we are fatigued or under-perform. Try running a car with the wrong petrol, no oil and inadequate water – it soon stops. Imagine taking the air out of the tyres as well – not likely to get very far either and yet that is exactly what so many of us do every day. Poor nutrition, too much low quality food, overloading with fat and carbohydrate would reduce vitamins, smoking and excessive alcohol, eating late and not getting enough exercise and sleep would be a common story around north London. You will get a bespoke diet for your clinical condition and to fit in your lifestyle. Here are some of examples of how our dietitian can improve your health and lifestyle. SURGERY TO LOSE WEIGHT OR NEED ADVICE ON POST SURGERY. CARER'S CREDIBLE AND PRACTICAL ADVICE ENSURING THE PERSON CARED FOR IS GETTING THE APPROPRIATE NUTRITION IN THEIR DIET. FOOD ALLERGY TESTING AND CONSULTATION. Why Dietitian and not a Nutrtionist? Dietitians are the only nutrition professionals to be regulated by law, and are governed by an ethical code to ensure that they always work to the highest standard. Only those registered with the statutory regulator, the Health & Care Professions Council (HCPC) can use the title of 'dietitian'. Chetali is currently practicing as a consultant dietitian in chronic diseases management, which includes conditions such as diabetes, heart diseases, irritable bowel syndrome and weight management. She has developed weight management programmes for adults, adolescents and their families; these programmes have been highly successful and are currently running throughout central London. 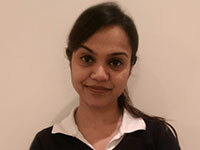 Chetali is a HCPC registered dietitian and a full member of British Dietetic Association. She has 12 years of experience in dietetics. She has special interest in Gastroenterological issues and Weight management, as food interaction in gut always fascinates her. Chetali can help to improve your health and lifestyle.